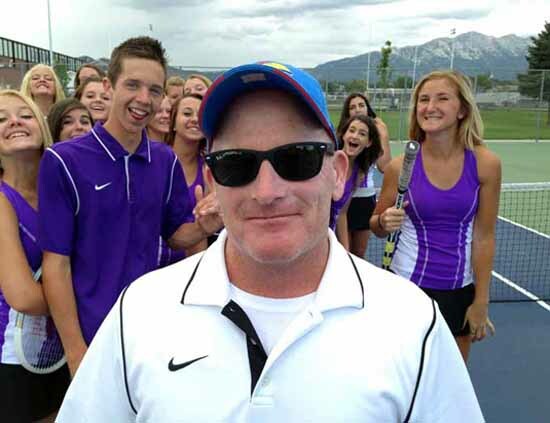 For the past 25 years, Alan Wofford has been the boys and girls tennis coach at Lehi High School, a remarkable accomplishment filled with many incredible memories along with many even more incredible friendships. I had the privilege of interviewing Wofford after practice on an overcast, yet warm, Monday evening on the grassy area between the historic Lehi tennis courts, with the rustle and bustle of Lehi’s Main Street during rush hour in the background. Having coached next to that busy and loud street for 25 years now, Coach Al has become quite oblivious and accustomed to the noise. Lehi tennis coach Alan Wofford has been on the job for 25 years. Other school’s tennis teams claim that the noise of Main Street provides a home-court advantage for the Pioneers, but Wofford and the Lehi players embrace the noise as one of the many things that make Lehi tennis so unique and so special. Tennis is what has brought, and continues to bring people together at Lehi High. But what KEEPS the people together, is the inevitable friendship one discovers when a part of the Lehi tennis program. One of the greatest non-player friendships that has been produced through Pioneer tennis is that between Al Wofford and Greg Lewis. Lewis is a vital factor in a good majority of our matches. Just who is Greg Lewis? He is the designated tennis team bus driver. I asked Coach Wofford about his friendship with Lewis, and Wofford just laughed and told me that a couple of years ago, Lewis took the tennis team down to St. George for the annual Duel in the Desert Tournament. Following that trip, he asked Wofford if he could be the team’s official bus driver, and since then he hasn’t stopped getting the tennis team to where its needs to be. The two have become such good friends after so many years of Lewis taking Wofford and the team to different schools all over the state of Utah. “It’s hard for me to think of Lehi tennis without Greg being a part of it,” Wofford said. Not only is Wofford a dedicated and inspiring tennis coach, he is also a history teacher at Lehi Junior High School. The coach has a passion for teaching history, and has traveled to several different countries all over the world. Teaching at the junior high has also helped with Wofford’s tennis coaching. Having met and convinced several of his junior high students to give the sport of tennis a shot, many of these students picked up rackets for the first time and have yet to put it down. One of the students Al convinced to give tennis a shot is Tyler Miller, now a senior at Lehi. Tyler started playing tennis in eighth grade and made the high school team his freshman year. Tyler quickly made his way through the team rankings, and found himself playing varsity No. 1 singles as a sophomore, which is an extremely rare, and difficult task to accomplish. Tyler attributes most of his success to Wofford and his example. The year Alan started coaching at Lehi High, the school had just barely moved from Class 2A to being a 3A school, which is wild to think because now Lehi is a 5A school, and one of the biggest schools in the state of Utah. Coach Alan Wofford (far left) and the 2016 Lehi High boys tennis team. I asked Wofford what makes Lehi High School tennis, and the tennis players therein, different from other schools. I asked Wofford, at the end of the interview, to share just a slice of wisdom that he has learned over the past 25 years, and his response addressed the work ethic that leads to athletic success. These three words to me, is what Lehi tennis is all about, and what Al Wofford has implemented into the tennis program at Lehi High School. When we play, we fight. And if we are willing to fight hard enough, our actions and efforts will pay off. I, myself, along with hundreds of other current and past Lehi tennis players, am grateful for the dedication, the inspiration and the friendship that our coach, Alan Wofford has exemplified in his coaching career. I know that several years down the road, I will still be able to drive up to the Lehi High School tennis courts, and see Al running a game of Offense/Defense, and catch up with not only a past coach, but a friend. Thank you Alan Wofford for 25 years of unwavering dedication to the Lehi High School tennis team. 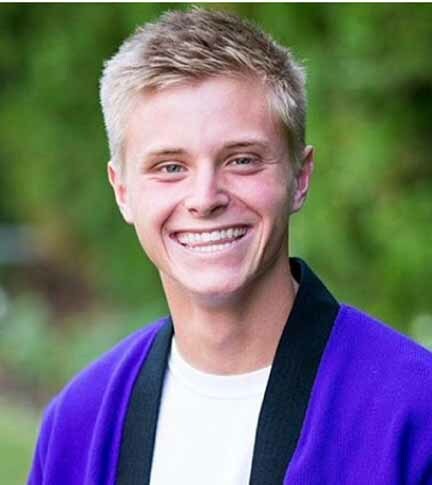 Lehi High senior Kenton Hartle wrote this story as part of the Preps Utah student journalism program, powered by Bank of American Fork, which will award two of our published student journalists college scholarships at the end of the school year. Hartle is a student in the Lehi sports marketing class and is the school’s student body president. He is also a Pioneer tennis player.